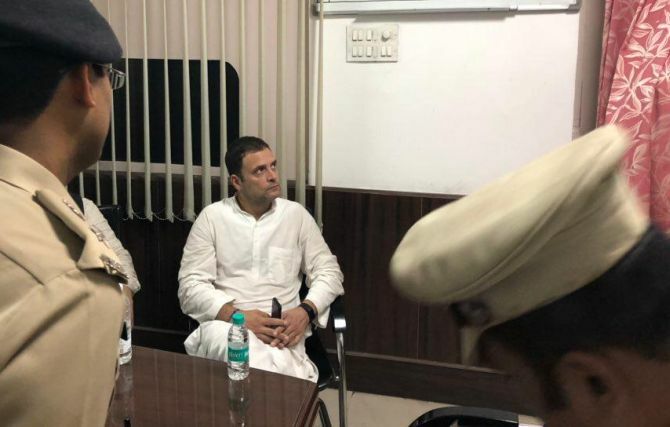 Congress chief Rahul Gandhi courted arrest on Friday after leading hundreds of his party's workers in a march to the Central Bureua of Investigation headquarters against its director Alok Verma being divested of his powers and to demand an apology from Prime Minister Narendra Modi. 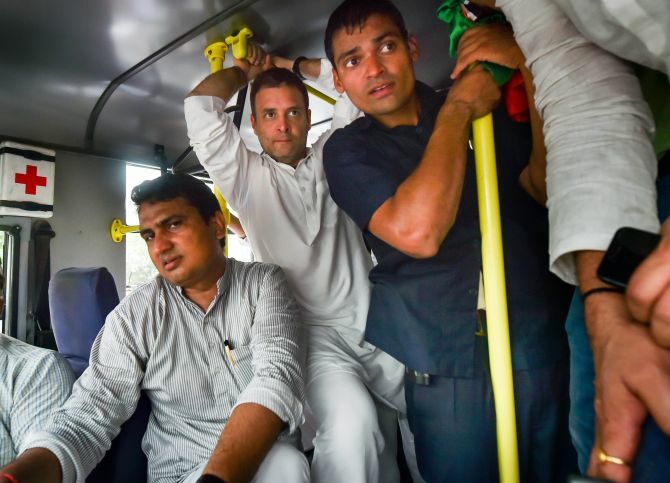 "Every institution in India being ruined by the prime minister," Gandhi said as the Congress took to the streets and marched from Dayal Singh College on Lodhi Road to the Central Bureau of Investigation headquarters about a kilometre away. The Congress president courted arrest along with senior leaders such as Ashok Gehlot and Bhupinder Singh Hooda. The Congress will not allow the chowkidaar (watchman) to do chori (theft), Gandhi said, reiterating his charges of corruption against the prime minister and saying he had "deposited Rs 30,000 crore in Anil Ambani's pocket". "He has stolen money from the Indian Air Force and the youth, and the entire country understands this. The prime minister can run but he cannot hide from the truth," Gandhi told reporters after courting arrest at the Lodhi Colony police station. There were no immediate reactions from the Prime Minister's Office on Gandhi's allegations. While Ambani has been consistently denying the allegations, the Bharatiya Janata Party has accused Gandhi of manufacturing lies everyday on the Rafale deal. "The truth will come out," Gandhi said, adding that removing the CBI director will not impact the truth. Addressing the gathering of Congress protesters earlier in the day, Gandhi accused Modi of destroying institutions such as the CBI, the Election Commission and the Enforcement Directorate. 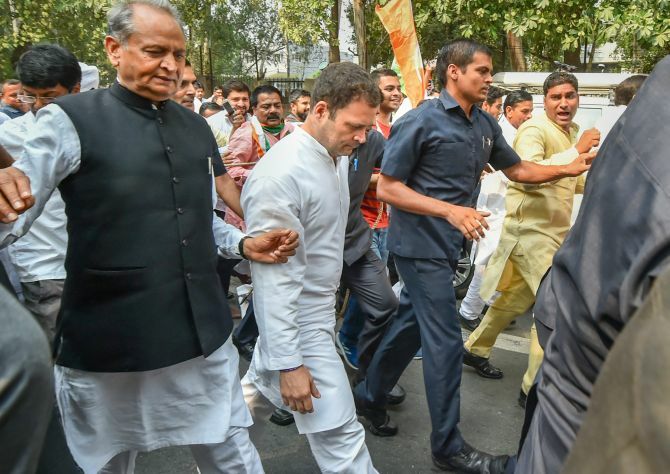 Senior Congress leaders, including Gehlot, Ahmed Patel, Motilal Vora, Veerappa Moily and Anand Sharma, took part in the march that culminated in a demonstration ahead of the CBI headquarters. Loktantrik Janata Dal leader Sharad Yadav, Communist Party of India leader D Raja and Trinamoll Congress's Nadimul Haque joined the protest. Carrying placards against the prime minister, the protesters walked the distance with scores of police personnel maintaining vigil and camera crews jostling with each other to capture the moment. One protester carried a placard depicting the CBI in a cage. Gandhi got on to a truck in front of the police barricades put up ahead of the CBI headquarters in the CGO complex to prevent the marchers from reaching the building. Gehlot said the decision to remove the CBI director was "illegal". "The chief justice of India, the leader of the opposition and the prime minister can together take a decision to remove him, but not the prime minister alone," he told reporters. "Our demand is to reinstate the CBI director...The prime minister should tender an apology to the nation for destroying the image of the premier investigating agency," Gehlot added. The government has strongly defended its decision, saying it was "absolutely essential" to maintain the CBI's institutional integrity and the move was based on recommendations by the Central Vigilance Commission. The Congress' protests in the national capital were replicated in other parts of the country. 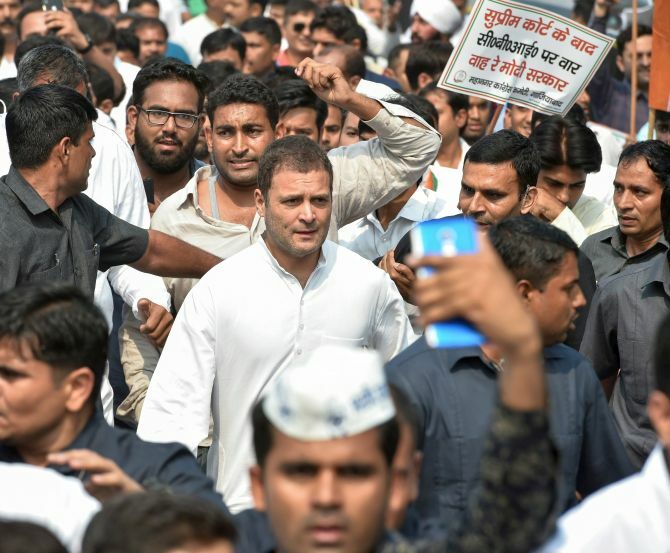 State Congress leaders led demonstrations in their regions against what the Congress described as the "illegal, unconstitutional and illegitimate removal of the CBI director by the Modi-Shah duo that has shamed India and its premier investigative agency". 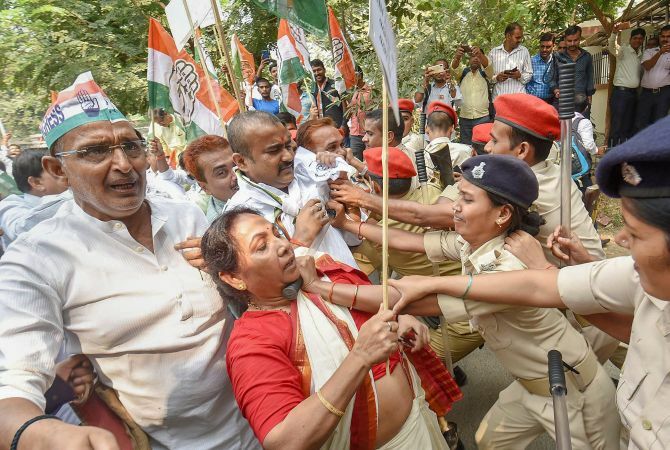 In Patna, for instance, Congress workers, including scores of women, sat on a dharna outside the gate of the CBI office at Bailey Road, carrying placards, reading 'Save CBI Save Democracy'. 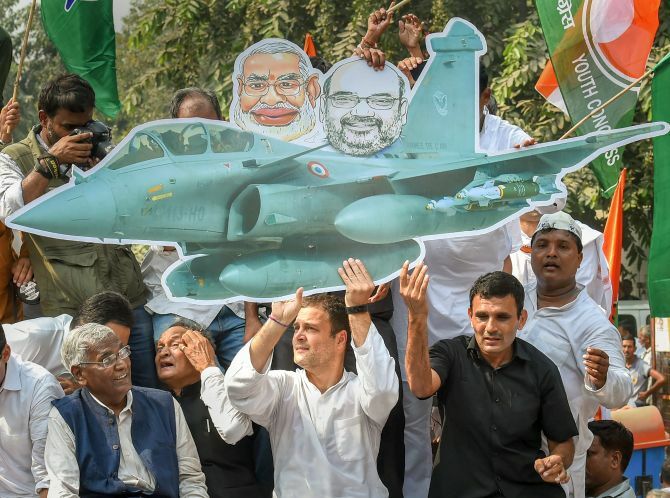 Alleging that the prime minister is experiencing 'Rafale-o-Phobia', the opposition party said the "demolition of the CBI" was prompted by fears that the director was going to conduct a probe into the fighter jet deal. Finance Minister Arun Jaitley has dismissed as "rubbish" the allegations by the Opposition that Verma was removed because he was collecting documents on the Rafale fighter jet deal. The Congress protest was held soon after the matter came up in the Supreme Court. The apex court said former Supreme Court judge A K Patnaik will oversee a CVC inquiry into the allegations and counter allegations and the report has to be placed before it within two weeks. It directed that interim CBI chief M Nageswar Rao shall not take any major policy decisions. Decisions taken by him since October 23 till date shall not be implemented, it said. All decisions taken by Rao shall be placed before the apex court in a sealed cover. The court sought a response from the CBI, the CVC and the Centre on Verma's plea challenging the government's decision to divest him of his duties.